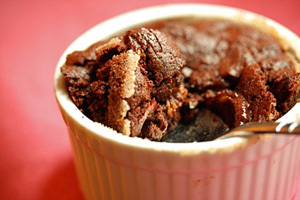 Since seeing the mounds of butter and melted chocolate oozing across the screen in “Julie and Julia,” I’ve been craving an indulgent chocolate dessert. So I made this rich, dark molten cake that’s crusty on top and soft and melted in the center. Adding a little zucchini is a great way to skim back a little on the fat and sugar. I love this great gluten-free recipe!!!! So quick and delish!